Our cutting edge design concept enables Ultra High Performance Supercars to maintain that critical height above the ground to maximise downforce whilst cornering, and yet adopt a low drag rake configuration whilst travelling at speed in a straight line. 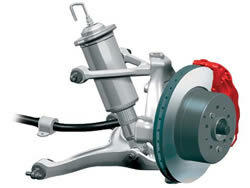 This enables much higher cruise speeds without overloading tyres and suspension with downforce when it is not required. The beneficial side effects are dynamic anti-squat, anti-dive and anti-roll without affecting the wheel rate with its usual resultant grip compromises.